By now, you’ve heard about the government of India’s decision to make 1,000- and 500-rupee notes worthless. A 1,000-rupee note is worth about $15.00, not exactly the equivalent of a $100 bill. What happened in India is the same as waking up one morning in the U.S. to find that President Obama had declared $20 and $10 bills to be worthless. The only recourse for Indian citizens is to bring the currency to the bank, where they can receive new bills in exchange. Of course, the tax authorities are waiting at the banks, so much of this money will simply be destroyed. The effect on the Indian economy has been devastating. The replacement bills are the wrong size for the ATMs, so the ATMs have ceased to function. The government did not print enough of the new bills, so the country is literally running out of cash. Riots have broken out at banks and supermarkets. 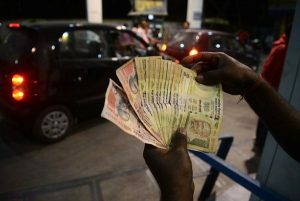 Truckers cannot buy gas, and fisherman cannot buy supplies, because no one will accept their 1,000-rupee notes. Click here to see how this is just one more example of out-of-touch elite technocrats pursuing so-called solutions without regard to the welfare of everyday citizens.